Sweets For Your Sweet - Prezzies For Your Man - Sugar, Darling? I absolutely LOVE giving people presents. I know lots of people claim it, but I genuinely do like giving presents more than receiving them, because I just love making people happy. Because of this, I always put lots of thought into the gifts I give and always get kind of confused and annoyed by people that just buy a load of random generic gifts and dish them out to whoever they need to give a present to - that isn't the spirit of Christmas guys!!! 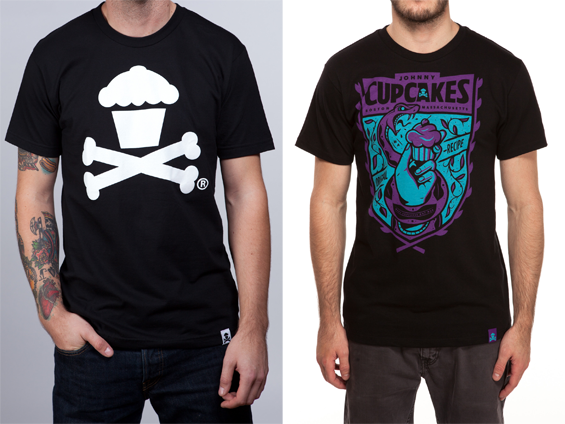 First up here are two shirts from fabulous clothing brand Johnny Cupcakes. Now if you aren't planning to visit their London store and need to order online it will come from the USA so you best be quick in order to get it in time for Christmas! First up is the Classic Crossbones shirt (which Pete already has) which is my favourite of all - JC shirts are fabulous quality and have great little details like super cute detail tags with sweet little messages embroidered onto them. Second up is the Original Recipe Crest shirt which looks like it's selling out super quick! 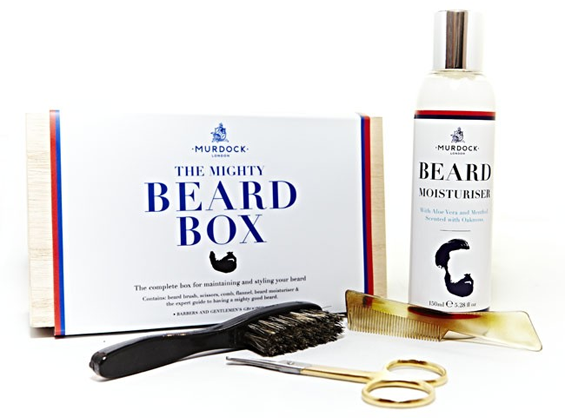 If, like me, you have a bearded gent in your life, you could really get into his good books by buying him The Mighty Beard Box from Murdock London. It features their very famous and apparently fabulous beard moisturiser along with some other essential beardy tools - a brush, comb and pair of cute (sorry, manly) gold beard trimming scissors all packaged in a cigar box. A good accessory is always a nice gift (as long as it is actually a nice accessory and not some crumby gift set from the Next bargain bin). 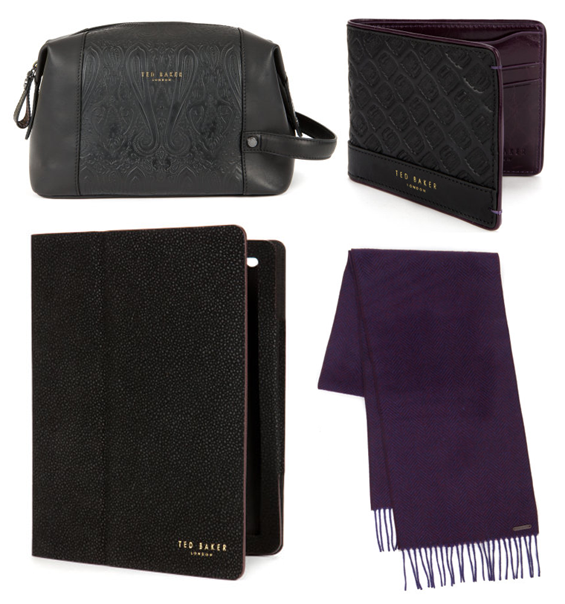 Ted Baker is a brand that can really knock out a great guy accessory mixing classically elegant male styles with more modern details, prints or finishes to bring them a little more up to date. Every man needs a nice wash bag for travelling and I just adore the embossed paisley print to this Wolfboy Leather Wash Bag. I feel a nice wallet is the sign of a man with taste, it's all in the details eh, and I just love the purple lining of this Hailcab wallet. If you have a gadget loving guy then why not give him a classy cover for his iPad like this Pickett Scotch Grain Case. Let's face it, all men look adorable in a scarf, so why not give your mayun a special one like this Twiglet Herringbone Scarf. For me, the best men's fragrances will always be by Guerlain, because this is what my Mum always bought for my Dad. 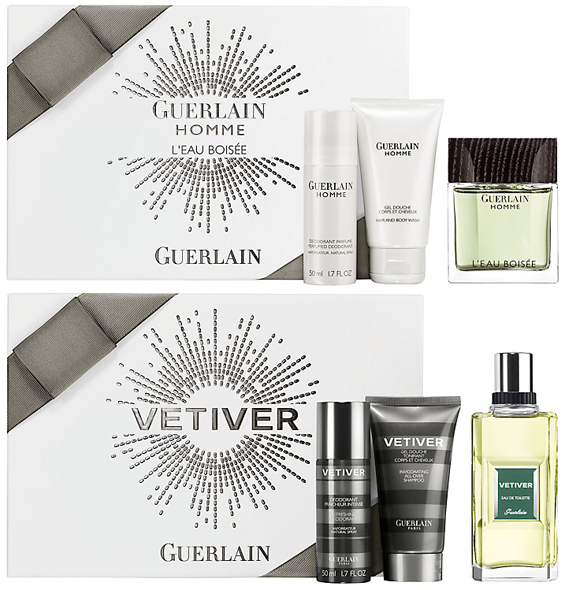 There are two men's fragrance gift sets available from Guerlain this year, firstly Homme L'eau Boisee and secondly Vetiver which to me is the true classic men's EDT. 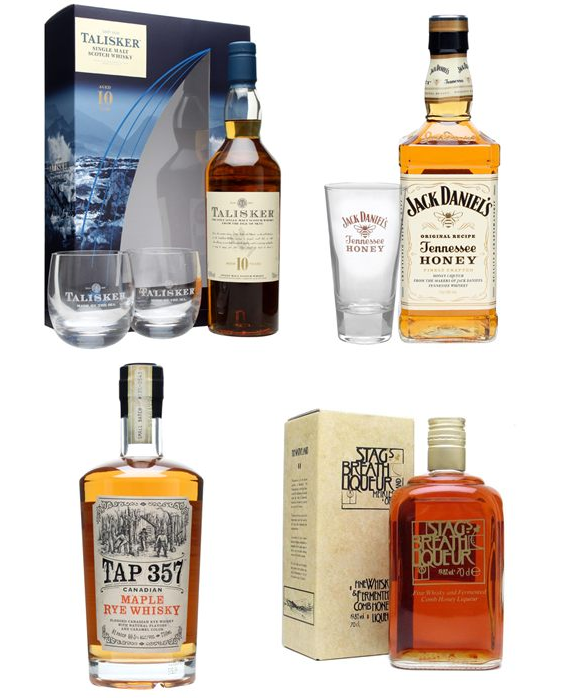 Lastly, for the real manly men out there, here are some nice whiskies and whisky based liqueurs from The Whisky Exchange which is an amazing resource for rare and unusual boozes - not just whiskies, they have an eeeexcellent range of gins and lots of other things too. First up is a great whisky gift set of 10 year old Talisker with two glasses - my Pete just loves the 15 year old too. I'm very partial to this Jack Daniels Tennessee Honey myself and this comes with a nice glass too - it's fab just with coke and especially nice in warm milk for a night time treat. I've not tried this Tap 357 myself but my guy is a big fan of maple syrup which this whisky is infused with so I recon it would be a winner. Last up we have another honey based liqueur which happens to have the fabulous name of 'Stag's Breath Liqueur' which cracked me up - I'd like to give this one a try whizzed into a nice chocolate milkshake, which I'm sure would steal the heart of any man worth his salt. I hope this little roundup helps some of you guys with your Christmas shopping! Are there any excellent boy presents that you've found this year?